The first major piece of work that NCOR’s Centre for Reviews and Summaries undertook was a systematic review of manual therapies in the treatment of babies and children. This was published in BMJ Open in January 2018, and is available at http://bmjopen.bmj.com/content/8/1/e019040. It is listed alongside all publications that NCOR staff have been involved in producing. Around the world between 10% and 25% of all osteopaths regularly treat babies and children . Critics of osteopathy often point to the lack of robust evidence in this area. NCOR’s Director Dr Dawn Carnes explains what we can do about this. Responses to questions we have been asked about this campaign. What will NCOR provide to donors? All donors can request an early copy of the report we produce from the systematic review. This is fully explained in the draft protocol for the systematic review (PDF). What will happen to the findings of the review? We will publish the findings of the review as this is good research practice and provides information for all clinicians whether in osteopathy or other healthcare disciplines, and for parents/carers. Some osteopaths have asked about “negative” findings; the findings of the review will highlight where existing research might recommend treatment or signpost where there is currently insufficient evidence highlighting the need for future research. All of the findings will help osteopaths to reflect on their practice and develop it further. We hope that this research will prompt constructive discussion and collaboration. What if the fundraising target is not met? NCOR are very grateful for donations at any time. We rely on the generosity of the UK’s osteopathic colleges, the General Osteopathic Council, the Institute of Osteopathy, and the Osteopathic Education Foundation for our existing income. This funds our small team of four part-time staff and allows us to continue to support the osteopathic profession. Any income generated during this campaign will be used to investigate the treatment of babies and children, even if we do not raise enough for a systematic review. Is there any promotional material for the campaign? Yes, you can download our press-pack (approx 1.6 Mb). In the press-pack you will find wording suitable for press-releases and magazine articles. You will also find an A4 poster and A6 postcards both suitable for displaying to patients in osteopathic clinics. It would be a great help to our campaign if clinic managers can display these materials in their clinics. From surveying hundreds of patients we know that they are nearly always very happy to help the osteopathic profession. Suitable for Facebook, Twitter, Google Plus, and most other social media. Image may work better for Linked In profiles. What criticism has osteopathic treatment of children attracted? Recent years have seen a steady stream of research, including much done by non-osteopaths, criticising osteopathic treatment of children . While there have been several pieces of research done by osteopaths into treatment of children , these are typically small studies and the frequency of publication is far lower, possibly because osteopathy is a comparatively small profession that is underfunded for conducting research. Small studies will always reach conclusions of limited certainty, and this is typical of the published studies. Why is NCOR conducting this research now? We were inspired in part by the recent OIA report . This was released in 2013, and was discussed at the Institute of Osteopathy convention in 2014. NCOR’s strategy includes international collaboration with the OIA and the International Osteopathic Research Network, as well as investigating adverse events and patient reported outcomes. In combination with the criticism mentioned above, these factors make this review timely. Also, existing reviews date from several years ago, and would benefit from bringing up to date. Why don’t we investigate “osteopathic treatment” instead of “manual treatment”? Osteopathy itself has proved very resistant to consistent definition. This makes it difficult to uncover “osteopathic” research in the existing literature. This is exacerbated by the fact that there is very little research that is done by osteopaths, as mentioned above. Instead it is more practical to search for literature that investigates the modalities used by osteopaths in clinical practice. NCOR and the UK General Osteopathic Council (GOsC) conducted a data collection exercise in 2008-2010 that described how osteopaths work . The GOsC also commissioned further research to clarify this picture . These surveys help us understand what treatment modalities are osteopathically relevant, and what research to investigate. The wider literature contains some positive studies showing that manual interventions can affect various outcomes. We propose to look at both symptom-related outcomes and satisfaction. 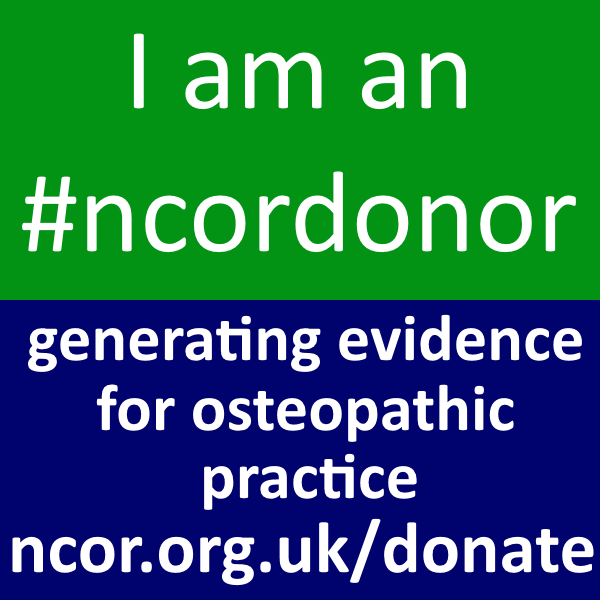 If you are a UK tax payer you can elect for NCOR to claim Gift Aid on your donation. Charities can take your donation – which is money you’ve already paid tax on – and reclaim the basic rate tax from HM Revenue & Customs (HMRC) on its ‘gross’ equivalent – the amount before basic rate tax was deducted. In order to do this we are required to collect your full name and address, and details of your donation including your wish for it to be a Gift Aid donation. You confirm you have paid or will pay an amount of Income Tax and/or Capital Gains Tax for the current tax year (6 April to 5 April) that is at least equal to the amount of tax that NCOR will reclaim on your gifts for the current tax year. You understand that other taxes such as VAT and Council Tax do not qualify. You understand the charity will reclaim 25p of tax on every £1 that you have given. If you pay Income Tax at the higher or additional rate and want to receive the additional tax relief due to you, you must include all your Gift Aid donations on your Self Assessment tax return or ask HM Revenue and Customs to adjust your tax code. Full details are available at the HMRC website. A small sample of recent research that is critical of osteopathic treatment of children. This list is illustrative, and not exhaustive. Recent research by osteopaths into treatment of children. This list is illustrative, and not exhaustive. How do osteopaths practise? – report by KPMG for the GOsC.